" Want to see my picture on the cover. Wanna buy five copies for my mother. Wanna see my smiling face on the cover of the Rolling Stone", umm Running Journal ! And finally what we've all been waiting for ! Taadaaa ! I made it on the cover ! As I have posted before, I never dreamed I'd be able to win this series which I have been following since it began as the Racing South Series 40 years ago. I had just hoped that some day I could compete in the series and maybe score a few points and have my name listed in the standings. 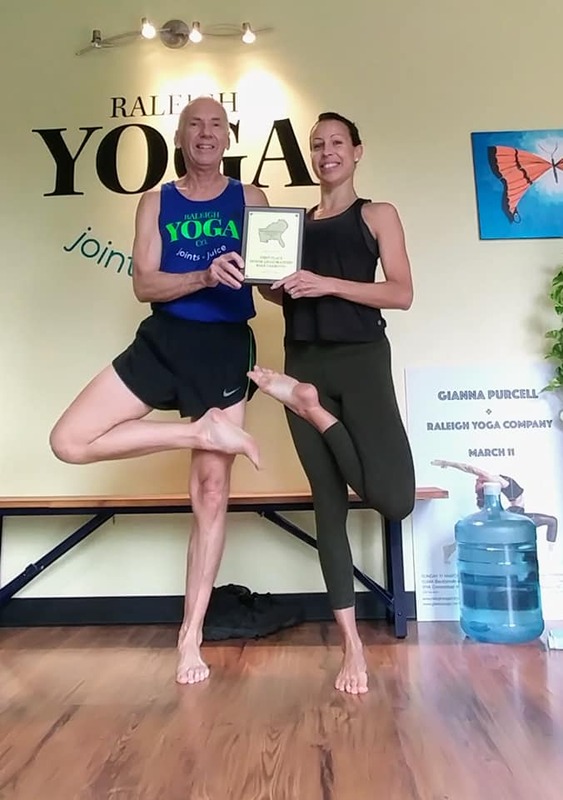 Until a few years ago podium finishes were rare for me but the series goes 8 deep in the Senior Grandmasters division (60-69) so I was hoping to score in at least a few events. But then when I decided to take a long break from the ultra marathons and get healthy and go back to racing in the shorter events I found myself making the podium more often than not. 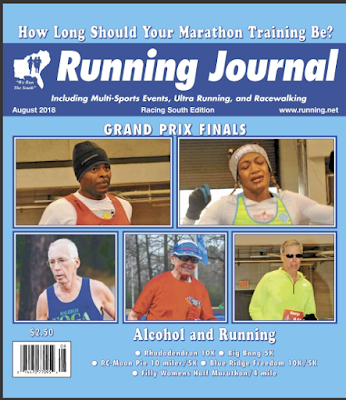 But after I won what I feel was one of my best races ever in the OBX Half marathon for the RRCA State Championship against 75 other eligible Seniors in Nov 2016 I began to believe I at least had a shot at not only being competitive but may actually be able to win the thing ! And as you know by now I was successful after a lot of hard work and hard racing in some of the top road races in the Southeast. I've posted race reports here in the blog for all the races so I won't go into that now but here is a listing of the races and placement in the Senior Grandmasters Division. Everyone of these races I can highly recommend as being top notch events if you ever plan on visiting any of these areas. Its hard to pick a favorite as I would gladly run any of them again if time and budget would allow but I'd have to say Magic City was my favorite. Great Venue, nice course, nice schwag and post race food and party atmosphere. I can't see myself trying to compete again as it is an expensive endeavor traveling to the races and I have other goals to shoot for now but I am so thankful for the opportunity and being able to achieve a dream and goal like this. Right now I am thinking I want to go back to Cotton Row and seek my revenge on that hill and maybe make the podium in my age group of 60-64 which I missed by 1 spot ! 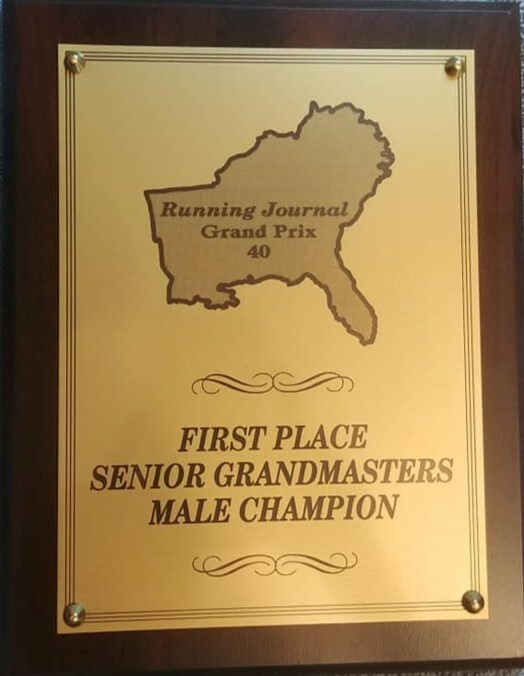 ( yes, 4 other studs in the 65-69 age group beat me !) Other than that the only repeat may be the one NC race next January. So that's the final word on the Series. Thank you to all that care and follow along on my adventures. Special Thanks to Mom and the rest of the family for loving me. And Thanks to my daily inspiration and dear friend and yoga teacher Laura for believing in me. Congratulations....that hill in Huntsville is a tough one!